The fourth PASC Conference took place in Lugano from 26 to 28 June. It has grown yet again, with close to 400 participants this time around. A photograph of the physicist Erwin Schrödinger, sailing through the air on skis in the snow-covered landscape of Arosa against a clear blue sky: it is a picture that EPFL professor Nicola Marzari likes to show when talking about the development history behind today’s materials research, and the public lecture he gave at the fourth PASC Conference was no exception. From 26 to 28 June, around 400 scientists convened at PASC17 in Lugano for an interdisciplinary exchange on topics in High Performance Computing. Marzari led his audience through the history of materials research, a field where Schrödinger came to play an important role: it was during a New Year’s stay in Arosa in 1925-26 that the physicist succeeded in formulating the equation named after him. It became a milestone for modern materials research and earned him a Nobel Prize. The Schrödinger equation described for the first time the quantum mechanical states of atoms and molecules, which among other things determine a material’s properties. A further breakthrough came with the development of density functional theory by physicist Walter Kohn. His work made it possible to solve the Schrödinger equation efficiently on a computer. For this, Kohn likewise was honoured with a Nobel Prize. High performance supercomputers notwithstanding, simulation and development of new materials – in the search for alternative energy sources, for example – remains a major challenge. As Marzari said, “Materials development is still ‘Edisonian’”: Thomas Alva Edison, inventor of the incandescent light bulb, is said to have tested 3000 different materials until he found one suitable as a filament. Today, that testing is done by supercomputers; they are the virtual laboratories of theoretical material scientists. As Marzari noted, computational science has since become a key element of research. The three-day conference offered a total of 47 minisymposia in the fields of Climate and Weather, Solid Earth Dynamics, Life Sciences, Chemistry and Materials, Computer Science and Applied Mathematics, Engineering and Emerging Domains in HPC, and a poster session with an award for the best poster. As well as the public lecture by Nicola Marzari, four other invited plenary speakers from various scientific disciplines stimulated lively interdisciplinary exchanges among the researchers. The conference opening by Boas Erez, Rector of Università della Svizzera italiana (USI), was directly followed by two keynote addresses: Haohuan Fu, Deputy Director of the National Supercomputing Centre in Wuxi, China, presented the Sunway TaihuLight supercomputer and the efforts on scaling and optimising climate and weather forecasting programs for the world’s most powerful supercomputer at present. Fu also publicised how the Chinese product is now going into production and being offered for sale on the international market. Following him was the renowned neuroscientist Katrin Amunts of the Jülich Research Centre, who reported on her research aimed at decoding the human brain as part of the Human Brain Project. Astrophysicist Katrin Heitmann of the University of Chicago enthralled the public with the mysteries of the universe and the part being played by supercomputers in deciphering them, then the physicist Matthias Troyer talked about Quantum High Performance Computing. neuromorphic and quantum computing, and also took questions from the audience. The scientists were unanimous that no single one of the architectures discussed will displace the others; rather they will coexist. Another panel tackled publication practices in HPC. While problems of traceability and reproducibility of scientific results predominated, there was also discussion about the paucity of recognition that the work of software developers has received to date. In addition to the panels and minisymposia, participants made intensive use of breaks and evening events for lively exchanges among disciplines. Piero Martinoli, President of USI from 2006-2016, was also honoured at the conference. In recognition of his total support for the development and implementation of Switzerland’s National Strategic Plan for High-Performance Computing and Networking (HPCN strategy), Thomas Schulthess, Director of CSCS and one of three spiritual fathers behind the strategy, presented him with a special 1962 edition of Friedrich Dürrenmatt’s “The Physicists” with original lithographs by the Swiss artist Hans Erni. It was a fitting gift, joked Schulthess, pointing out that the principal movers in the development and implementation of the HPCN strategy are themselves all physicists and, like in the book, there are three of them. Along with Schulthess and Martinoli, the third in the triumvirate was the physicist Ralph Eichler, President of ETH Zurich from 2007-2015. The Platform for Advanced Scientific Computing (PASC) is part of the HPCN strategy and it was this project that gave rise to the PASC Conference four years ago. 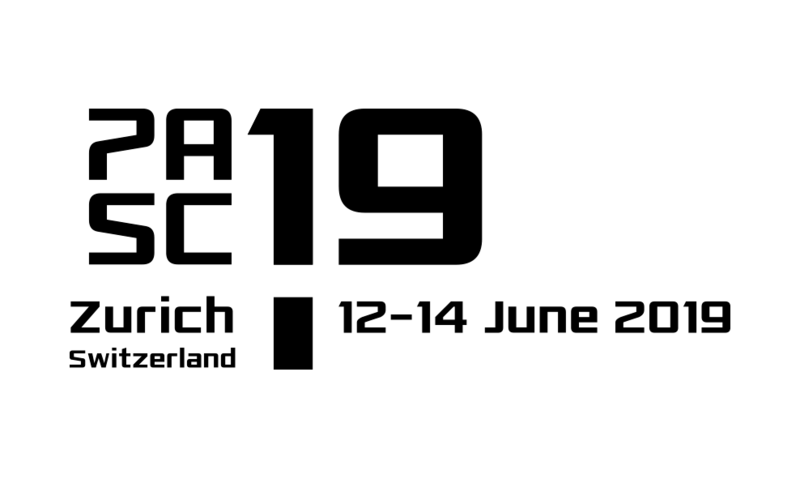 PASC18 is set for 2-4 July 2018 in Basel. Save the date!